The supersoul, the Lord in the heart, exists only in the material world. Although He reminds us of our past life’s desires, the real reason He accompanies us is to guide us back to Him. In this issue we look at how and why we either tune in or tune out that guidance. Krsna says, ye yatha mam prapadyante, tams tathaiva bhajamy aham, “As they surrender, I reward accordingly.” Of course, this also means “as they don’t surrender” I reward (or punish) accordingly. So what does this mean for us? 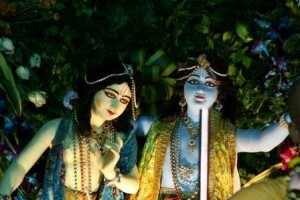 If we are sincere devotees Krsna will help us. And if we want to fall away from Krsna, He will help us do that also. If God Himself helps you forget Him, then forgetting Him will be so easy and effortless that you will forget Him for millions of years and not even be concerned about it. Prabhupada was once asked if it is difficult to find a genuine guru. He said the difficulty is not in finding a guru; the difficulty is being sincere. If one is not sincere, Krsna will send a cheater. So sincerity is the qualification for getting proper guidance, both in finding a bona-fide guru and in taking direction from within (caitya guru). A devotee once asked Prabhupada, “How do we become sincere?” Prabhupada simply replied, “By being sincere.” We can be sincere right now. The ball is in our court. Loving Krsna is, of course, a gradual process. Sincerity isn’t. Now, you might ask, “If I am sincere does it mean Krsna will reveal whatever I need to know to serve Him.” In a broad sense, the answer is yes. But this also can mean that Krsna will reveal how you are best suited to serve – and not suited to serve. For example, I may have a particular service that inspires me, but I lack the ability to execute some aspects of the service. In this situation, Krsna giving me intelligence could mean that I recognize my shortcomings and find someone more qualified to help me. And if there is no one to help, taking internal guidance could mean either doing another service I am more qualified to do or doing the service and remaining satisfied with a lesser outcome. Prabhupada writes that Krsna is always trying to give us knowledge from within. The problem is that we don’t always tune into it. If our receiver is weak, when Krsna broadcasts His message to us we may not hear it. The following story illustrates this point. Once there was a flood and an emergency vehicle came to save the pastor of a church. He refused to go saying, “I trust that God will save me.” When the waters rose he went to the roof of the church for safety. When a boat came he also refused to go. Again he said, “God will save me.” When the water rose so high that he was about to drown, a helicopter came for him and again he would not accept help because he had faith that God would save him. He ended up dying in the flood and when he got to heaven he asked God why He didn’t save him. God replied, “I tried to save you. I sent you an ambulance, a boat and a helicopter but you refused to accept them.” So although our process of bhakti means we take knowledge through a descending process, it doesn’t mean we do not use our intelligence. Although we should feel ourselves a fool before the spiritual master, we should not act foolishly. The guru tells us what to do and we use our God given intelligence to execute those orders. So how do we tune in? It is with our sincerity and surrender. As you turn up your sincerity, the volume of the broadcast increases. Have you ever heard that little voice of wisdom faintly speaking to you, but you turned down the volume because you didn’t like what it was saying? Often, the more something is true, the less we like to hear it. So when Krsna is telling us from within to do something we don’t want to do, or when He is telling us to stop doing something we are attached to, what should we do? Have you ever had a gut feeling about something but didn’t act on it and later regretted it? When we hear Krsna speaking to us in this intuitive way, it is His mercy, His special gift. He is offering us personal guidance. When we don’t take it, it’s like refusing a wonderful gift from a friend. Realizations are Krsna’s special gifts to us, gems of wisdom personally delivered for our individual spiritual progress. What a good friend He is! Krsna is so kind that He also speaks to us through others. Has anyone ever told you something about yourself or about something you did – and deep down you knew it was true – but you just didn’t want to hear it, what to speak of admit it (this just happened to me this morning)? If we are open, Krsna will instruct us in many ways. But if we are closed, we may never see the writing on the wall – even though it’s written in big bold letters. So how do we tune in to Krsna’s station? Tune your dial to sincerity and success is assured. “One who does good will never be overcome by evil.” Connect with the very sincerity that first brought you to Krsna. That sincerity that first brought you to Krsna will continue to keep you in Krsna consciousness. Sincerity is one of your most precious assets. Take some time to answer these questions. This will help you tune in. What do you think Krsna is telling you to do that you are tuning out? What do you think Krsna is telling you to stop doing that you are tuning out? Why are you tuning Him out? How can you better tune Him in? How would your life be better if you tuned in more?